When I asked Rorschach for a way to deal with packages in IgnorePkg, he added the -c option to archup, but I didn't really figure out a nice way to filter those ignored packages out then and decided against using archup anyway. Now I have things in IgnorePkg again and it forces me to stop using aarchup. Perhaps you could add some option allowing to filter them out to aarchup itself or maybe you have an idea for a (shell) script returning contents of pacman -Qu without ignored packages? pacman -Qu | grep -Evi "pacman|vlc"
but you would need to write twice the ignoredPkgs one at /etc/pacman.conf and one at the command. It will read the packages from /etc/pacman.conf call "pacman -Qu" and filter the packages. If you don't mind using python of course. Tell me if it does what you want. Also do you need it to consider ignoreGroup too? Your script seems to be working okay, thanks. I personally have no need for IgnoreGroup. I'm glad I could help, will think if it's worth implementing that built-in aarchup. I composed a patch for "pacman" exactly for this case (discussion). I know little about internals of "pacman", so use it at your own risk. Version 1.6.2 should ignore those packages by default, could you see if it works fine? Also it should work for AUR pkgs if you use --aur as long as you have the packages in IgnorePkg. Could you paste the part of IgnorePkg from pacman.conf? DEBUG(info): /etc/aarchup.conf was not found using args instead. DEBUG(info): Reading /etc/pacman.conf for IgnorePkg list. DEBUG(info): Notification was shown with success. If I comment out ShowSize, the error mentions TotalDownload. and keep using that script, I will try to figure something out. Please forgive me for this bug, I made the mistake of doing some wrong assumptions about pacman.conf syntax. Could you please update it to 1.6.3 and give me your feedback? With both libssh2 and zsh in IgnorePkg, notification doesn't show. With only one of them there, the notification shows both of them. Could you please update and check again? Sorry for the trouble and thanks for testing and reporting. Works perfectly, even with yaourt -Qyu. AUR-packages are also shown via cower. But I want a tray-icon, just like the notification in debian/ubuntu that changes its icon when packages are available and will send a notification-popup, but just once. Would also be nice to add a default action maybe via right-click-menu or as a button on the popup. I appreciate your feedback but aarchup is supposed to be as less intrusive as possible and I myself hate having a lot of stuff in tray area. The point is just to notify when there are updates available if the icon is not there, it probably means that there aren't new updates. It's supposed to be just a notifier and not a tray icon with notifications. You probably could try pacman-notifier or Yapan but I don't know if they support AUR. 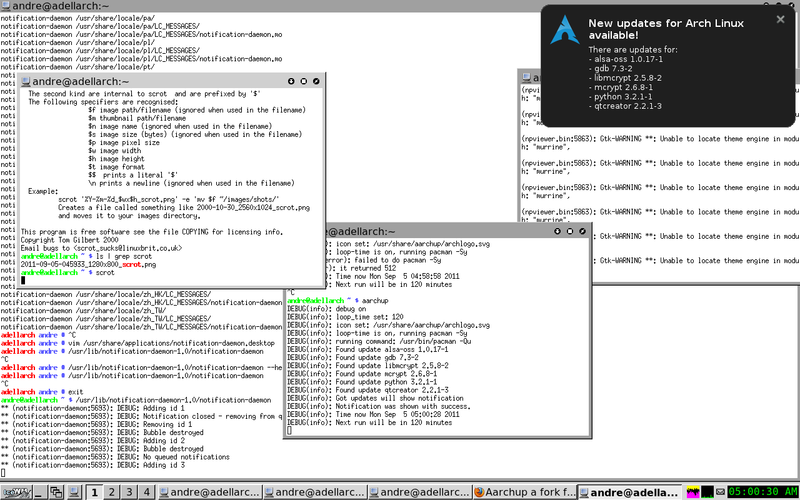 Could you recompile(reinstall) aarchup, also "pacman -Q libnotify", Whats the version of it? DEBUG(error): It could have been caused by an enviroment restart. DEBUG(error): Trying to work around it by reinitin libnotify.